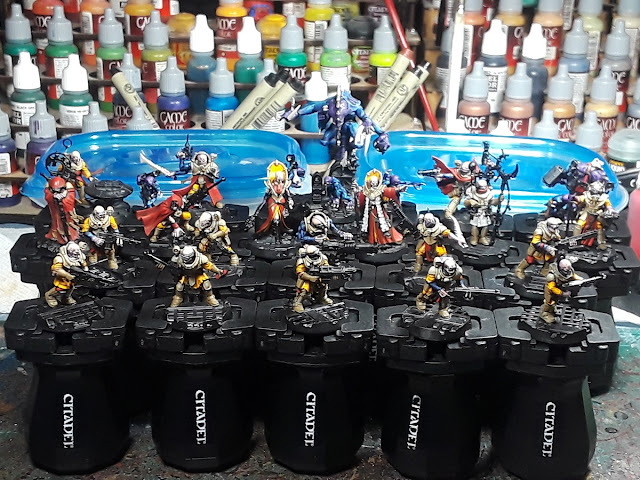 Mordian 7th Regiment: Necromunda - The Brotherhood of the Argent Spiral resurfaces! Necromunda - The Brotherhood of the Argent Spiral resurfaces! In the wake of all the World Eaters semi-monochomatic armor, I felt the need to break out some different colors. 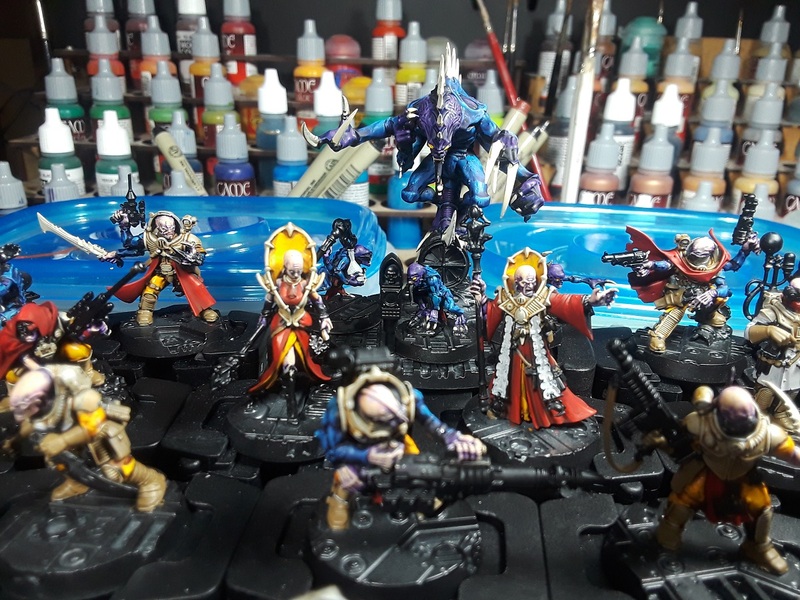 Right around the same time GW released the most recent wave of Genestealer Cult models which are all amazing - Though I have no intention of doing a full-on 40k army of 'em, I had to paint 'em, and what better way to justify a bunch of character models than by working them into a new Genestealer Cult gang for Necromunda? Following Adepticon I'm planning on running a Necromunda campaign for a group of friends, and have been working up a number of miscellaneous bad guys, critters, monsters and mutants for use in special scenarios, and one of the 'storylines' I have planned is a cult uprising which the various players can attempt to stop (or align with, depending on how things play out). Should be fun! Definitely went a little more colorful on these guys than recent projects, and varied somewhat from my usual 'three colors' idea. Blue and yellow always set off nicely against each other, while the red and white offer up a separate contrast (and the red sets off against the blue and yellow as well). Most of the red cloaks/coats will be getting a spiral motif (hence the cult name) in white/silver, which whould hopefully look pretty neat! Still a ways to go, but they're well on the path! Thanks bud! Loving the new models, they've been a joy to paint so far! All the handles! I bought one, then four more after I realized how much I liked the first one, then my GF got me 15(!) more for Christmas after I'd mentioned how having enough to batch paint with would be awesome. Best hobby present ever! I'm sure I can see more than 20. Looks like you got a handle infestation there. I like the nod to old school colours. Man, I haven't thought about Tim in years. It's entirely possible that he exploded from sheer excitement. Indeed! His stuff was such an inspiration at the time, who would have thought we'd ever see such a resurgence of an old, old idea! Nostalgia, hoooooo! Those are looking great! I kept mine a bit more subdued, but GSC do look excellent in super bright colours like you've got there. Cheers! Aye they ended up pretty loud so far, which is probably okay for the garish nature of the Underhive. I do love the more sinister subdued scheme you did! Nice mate! Loving the scheme so far. Funnily enough I also have some of these new lovely GSC figs and plan to try to replicate that old scheme from the original 1990 something article of the khornate cult. Excellent! I know exactly what you're referring to, can't wait to see what you come up with!